It would be unfair to mention Tom Bihn's Care Label without giving a mention to our very own Innocent Drinks fruit smoothie labels which keep Mary and I amused on a regular basis. They also make An Innocent Promise such as "We promise that anything innocent will always taste good and do you good. We promise that we'll never use concentrates, preservatives, stabilisers, or any weird stuff in our drinks. And we promise we'll never cheat at cards." Or "... And we promise always to wipe our feet" or "... And if we do you can tell our mums" and so on. More at "The Label Museum"
The inside label carries instructions on washing and caring for the bags. 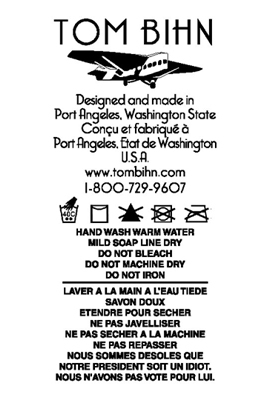 Because the bags are sold in Canada, the instructions are also printed in French. The French version, however, contains an additional phrase: "NOUS SOMMES DESOLES QUE NOTRE PRESIDENT SOIT UN IDIOT. NOUS N'AVONS PAS VOTE POUR LUI." Translated to English, the phrase reads, "We are sorry that our President is an idiot. We did not vote for him." Saturday morning I collected Cleo's ashes from the Vets. They are now nourishing the roots of a rosebush and not just any old rosebush. When we lost Oliver, our Persian ginger tom, to an RTA a few years back we buried him near the bottom of the garden. You can do that when you have half an acre. Our neighbour, cat feeder and house-minder Mike bought us a rose called appropriately "Whiskey Mac" which we planted next to Oliver. When we lost Oscar ["Saddest news about Oscar"] we buried him next to his chum Oliver. When we sold the cottage the rose was the one plant we had to bring with us; by that time we already knew Cleo's biopsy results. A small London garden is not really suitable for an inhumation so we had an individual cremation for Cleo. Her ashes went in first then a little soil to cover, then some fish and bone meal then the rose. I cannot be doing with this macho "boys don't cry" b*ll*cks. I had a good old sob but in the summer I can look at the roses and smile. I love how much can be conveyed with just the raise of an eyebrow or the lift of a finger. On the North side of Waterloo Bridge there is a cycle path that crosses the pavement much to the startlement of many an unsuspecting pedestrian. As a cyclist I know it's there and cast a quick glance over my right shoulder. A cyclist is approaching so I pause mid-stride. We make eye contact, he give the slightest of nods ("thank you"), I echo back a nod ("you're welcome"), he whizzes by and on I go. Courtesies exchanged to complement the morning sunshine. Tuesday Mum and Dad came up to London to see Jane&Pete's flat in Soho and brother Ian came to join us. It had been meant as a family gathering but at the last minute Pete's Aunt Freda and Jane's oldest friend JaneF were added to the roster. The assembled company marvelled at the transformation of the flat then we went round the corner to The Groucho Club* for a family lunch. Another long lunch catching up on JaneF's French hovels and back to work to make up the hours. 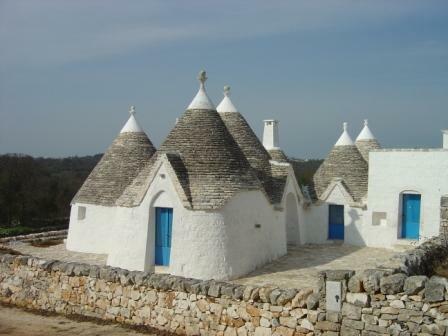 * The name of the club was inspired by one of Groucho Marx's quips; "I don't want to join a club that will accept me as a member"
We had a couple of enquiries about renting "Trullo Azzurro" which have not, unfortunately, turned into bookings. However it was enough to prompt us to squeeze in an extra trip to Puglia to see how the Hovel-in-the-Hills ™ had survived the winter. Mary was going to the Madame Butterfly on Friday with her friend Andrea so we had to fly out on Saturday. We could not face Ryanair and anyway they are not so cheap as you get close to the departure date. Instead we flew Alitalia changing in Milan Malpensa (MXP). That meant we arrived in daylight with the shops still open so we could get breakfast stuff and have time to examine the property on arrival. It had survived the winter very well: last year's plasterwork had obviously finished drying out and the bags and boxes we used for storage had done the trick. The hot water and heating seemed to be working fine but the control box was being a little erratic. We got the underfloor heating working and the place slowly warmed up. Sunday was a little overcast but Monday was bright and sunny so we could open all the doors and get the bedding aired on the line. We called in Daniele, the architect, and Ignazio, the heating engineer, to look at the boiler controls and discuss a few minor repair items about the place. Then lunch and back to Bari airport for the trip home. Yesterday I met up with sister Jane to see how their pied-a-terre is coming along. She told me it was one year and one week to the day since they first went to see the flat. And now it is all but finished and they have done a good job on it. Just a few minor tweaks remaining. It used to be basically one large room with a separate kitchen at one end and a bathroom. The whole place has been gutted and redone completely, new everything. The bathroom is great, all beige and tiled, it looks like a five star hotel bathroom. The kitchen wall has been taken out and they have gone open plan. The bed area is now where the kitchen was and there is a small kitchen "corner" next to it which partially screens off the bed area. Then a TV and chairs in the actual corner and a desk / home office and storage in an alcove. Having inspected the premises, we tested out the local Tapas restaurant to see if it would be OK for Mum and Dad's visit next week. Something of a leisurely lunch, I'll make up the hours later.